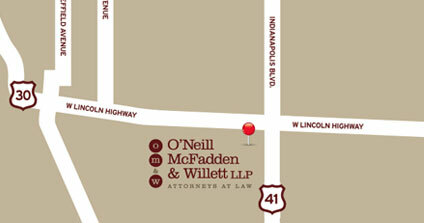 A litigation boutique law firm, O’Neill McFadden & Willett LLP was founded in 2010 as a spin-off from a national law firm. Since then, O’Neill McFadden & Willett LLP has grown the scope and breadth of its law practice. The lawyers and professional staff at O’Neill McFadden & Willett LLP, are dedicated to providing quality, creative and cost-effective legal representation to current and future clients who place their confidence in our hands. O’Neill McFadden & Willett LLP’s lawyers are best known for their aggressive and cost-effective trial practice and appellate experience, attention to detail, and team approach to litigation. 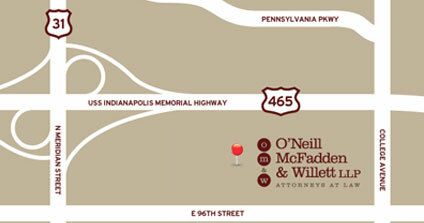 From its inception, O’Neill McFadden & Willett LLP has specialized in the defense of professional liability claims against physicians and lawyers, as well as complex tort, commercial litigation and employment law throughout the State of Indiana. We also provide local counsel services to clients from across the country, and risk management services to professional firms, practices and business organizations. At OMW, we work closely with our clients to determine the best strategy and approach to each litigation matter. This typically results in an aggressive plan that leads to a favorable resolution. As our trial and appellate results show, our skill, experience and passion for our practice serves our clients well.